Yesterday, the Times published a story on page A1 detailing the relationship between Bernie Madoff and the Mets and how the lawsuit brought against Fred Wilpon and Saul Katz suggests it's "deeper than anyone might have suspected." And today, the Mets (or more accurately, their lawyers) fired back at Irving Picard, the trustee for the Madoff victims, in a Daily News article teased on that paper's front page. David Caplan of Davis Polk Wardwell LLP told The News Wednesday that the suit filed in December against the Wilpons and Fred Wilpon's brother-in law Saul Katz by Madoff trustee Irving Picard is a "strong-arm" attempt to squeeze hundreds of millions of dollars out of Sterling Equities, the firm controlled by Fred Wilpon and Katz. "We believe the complaint is baseless, both factually and legally," Caplan said. "We have conveyed that to the trustee's counsel. Fred Wilpon, Saul and the other partners did not know that Bernie Madoff was running a Ponzi scheme." 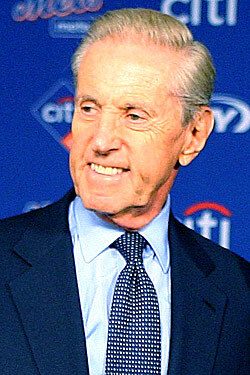 The Mets' lawyers, according to the article, believe that recent Times reports on the subject were the result of leaks by Picard's office, while another source close to the Wilpons says that the allegation that Madoff played a wide role in the Mets finances is designed to coerce the Wilpons into an unfair settlement. The combination of money, sports, and a high-profile lawsuit makes this a perfect story for the local tabloids, and it broke at a perfect time, just days after the Jets lost to Pittsburgh, kicking off one of the duller months on the sports calendar. Any shred of news can become a front or back page right now: See the Post today, where the back page plays up Mark Cuban's comments about how he wouldn't reach out to the Mets about buying a piece of the team, but that he'd listen if they reached out to him. Capital New York, though, suggests that with today's article, the News is really going after the Times: "Here, [Caplan] gets to pick his battle with Picard, and the News gets to make out like the Times was suckered by a lawyer." The Mets have a lawsuit to worry about — the amount on the check they may have to write is what will ultimately determine how much trouble the franchise is in — but it appears they're also ready to defend themselves in the press, ensuring that the public, and their fan base especially, hears their side of the story. Today, the Mets struck back. The longer this story drags out, the better the odds that it won't be the last time.